Single axle trailer, The boat motor and trailer are like new, This 57 year old Dunphy, made in Oshkosh, Wisconsin, was purchased at an estate sale. One can see by the "before" pictures that much work needed to be done to restore the beauty that these mahogany boats were noted for by all boatmen in the 1940's and 50's. The boat was stripped down on the outside to the bare wood. Both splash rails and the seats were removed, along with the transom. The transom was moved forward one inch to rid the boat of the holes that were created with too many screws, which caused leakage. All the screws in the boat were also removed and replaced with stainless steel screws. On the outside all the water marks were removed with wood bleach, the color was put back in by staining to the original mahogany color, and covered with Epoxy-plus from Clark Craft in Tonawanda, New York. The completed job occurred with the application of two coats of Z-Spar Captains Varnish win UV qualities. Two oars in excellent condition also accomplice the Dunphy. The boats unique blue bottom was painted to meet the original color as applied in 1952 The trailer is not an original Dunphy trailer, but fit well with the boat. Once again, the trailer was stripped down, primed and painted. It's color was used to match the blue tarp that covers the Dunphy. The unique individual wheel suspension system makes it easy to haul the boat for miles and miles. New tires and stainless steal rims were put on the trailer. The 53 year old Scott-Atwater 7 1/2 HP motor was also restored to run like it did in 1956! The motor did not run for over twenty years. But, because the original parts manual was available, all the rubber parts were replaced and, in a short order, the motor was running as it did 53 year ago right out of the factory. This boat is a step back in time with added strength of modern materials that will result is years and years of great enjoyment by the true runabout crowd. 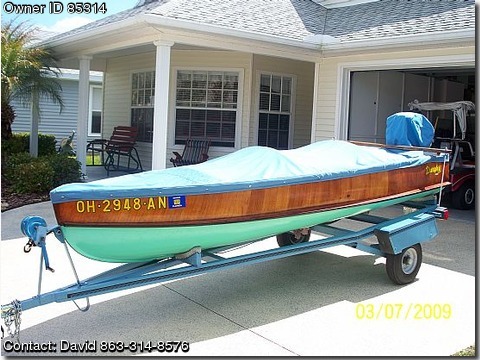 The work, and love, put into this boat makes it will worth the asking price.